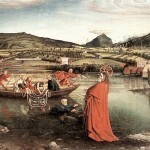 Very little has been written about the life of the Swiss painter Konrad Witz but many words have been written about his work. As Europe was entering the Renaissance, more and more painters were emerging as artists rather than mere craftsman and their works were just starting to receive the recognition they deserved. Witz was born in Rottweil in 1400 or 1410. Rottweil was originally founded by the Romans, became part of the Swiss Confederacy in 1643 and around the time of Napoleon came under German rule. Witz is generally considered German by birth but Swiss by choice, becoming a citizen of Basel during his relatively short career. We are fortunate that a number of his works have survived the centuries. More than one scholar proclaimed Witz to be the best painter of water in history. This bold claim is most often supported by referring to his painting Saint Christopher which is believed to have been painted in 1435. The water ripples, bubbles and reflects shadows upon a glass-like surface. The shades of blue, green and brown offer a most realistic representation of a small waterway. 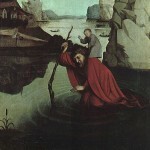 The St. Peter Altarpiece of 1444 contains his most famous composition, the Miraculous Draught of Fishes. The Fishes is thought by many to be the first real landscape painting – if you identify real landscape as one that is recognizable. It was Witz who first included in this painting a landscape that was not a composite of his imagination but of an actual place, in this case, Lake Geneva and the Saleve Mountains, including Mount Blanc. The Basel Guild of Painters recorded the admittance of ‘Master Konrad of Rottweil’ in 1434 to their society. His works would imply at least some training in the Netherlandish and Flemish styles. His last signed painting was dated 1444 and he is believed to have died in 1445 or 1446. 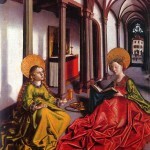 His contemporaries included Jan Van Eyck and Paolo Uccello.